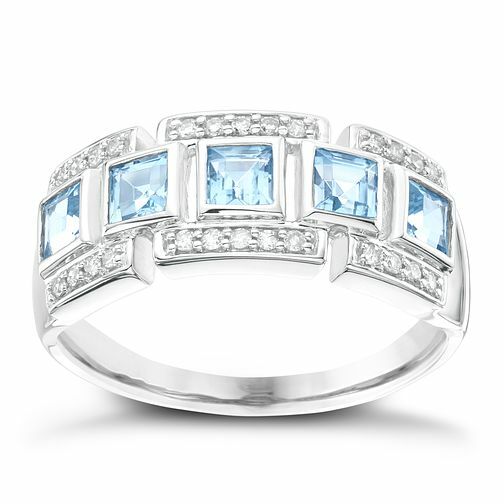 Cool 9ct white gold is the perfect match for blue topaz teamed with sparkling diamonds in this lovely design. Crafted as an everlasting token of your love, this stunning ring will take their breath away. 9ct White Gold Blue Topaz & Diamond Eternity Ring is rated 5.0 out of 5 by 1. Rated 5 out of 5 by Anonymous from Beautiful ring. A beautiful solid ring. Have had many comments about the cut and style of the ring. Lucky enough to be able to purchase when in sale. You won't be disappointed!